Gary Simmons: Fade to Black (exhibition view). Artist Gary Simmons — who received his MFA at CalArts in 1990 and recently returned to Los Angeles — references film, architecture, and American popular culture in paintings and drawings that address race, class, and memory. Much of Simmons’s work centers on his signature erasure techniques. Early in his career, he drew in white chalk on readymade chalkboards or directly onto slate-painted walls, then smudged the images with his hands. In recent years, he has adapted the process to canvas and large-scale wall works, such as Blue Field Explosions (2009), a monumental drawing in the stadium that is home to the Dallas Cowboys. 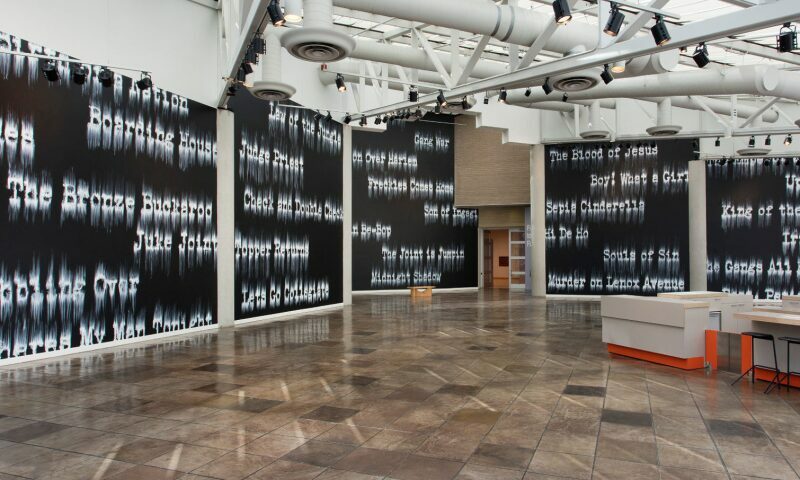 In his first museum exhibition in Los Angeles, Simmons’s “canvas” will be the five large 440-square-foot walls in CAAM’s grand lobby, where he is creating a site-specific painting that includes titles of vintage silent films that feature all–African American casts.